Some memories just stay with us. 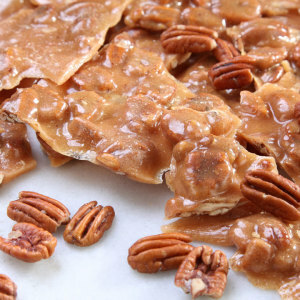 No matter how old we may be, we remember that first crackling bite into a piece of peanut brittle. It may have been rectangular, triangular, a square or just a handful of jagged pieces, but that wondrous mix of salt and sweet, crunch and chew stimulated every taste bud on our tongues, and yes, presented a challenge to our teeth. If you were a young child when you were introduced to old fashioned peanut brittle you probably explored it with every sense; feeling its hard surface and tracing each peanut bump, sniffing its alluring peanut smell. Perhaps you gave it a test lick before taking a tentative bite and then another as your heard your teeth crunch into it. 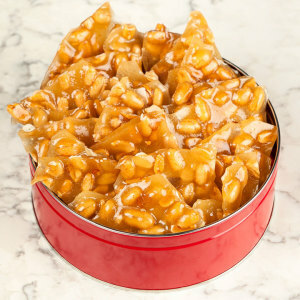 Peanut brittle is such a part of our lives we find it hard to believe there was once a time before brittle. Who Came up With the Idea of Peanut Brittle ? Believe it or not, there are some who think it was all a big mistake. There's been a legend going around for years that sometime around 1890, a woman somewhere in the South was making taffy when she mistook baking soda for cream of tartar, which is a plausible mistake, both being white and powdery. She caught her error, but being frugal and not wanting to waste all the ingredients, she went ahead and put it in the oven anyway, hoping for the best. And the best is what she got. Instead of the chewy yielding texture characteristic of fresh taffy, which is a wonder in itself, she pulled from the oven a slab of hard shiny candy. Upon tasting this brittle substance, she was delighted with her error and went on to experiment with subsequent batches. And it being the south, where peanuts thrive in the warm climate, she poured a few into one batch, and the rest is history. Another version places the woman in New England, and yet another traces it back to the Celts who mixed sugar with peanut butter and roasted it as a holiday treat. This tale has the Irish bringing the recipe to America circa 1830. But whatever its origins, peanut brittle became America's sweetheart, and even provided energy for soldiers in the midst of battle. Ask a thousand cooks how to make peanut brittle , and you'll get a thousand variations. The basic recipe calls for mixing sugar or corn syrup with water and heating it to 130 degrees Fahrenheit until it takes on the consistency of caramel, then adding peanuts, a leavening agent, and spices, and finally spreading it out onto a flat surface, traditionally marble or slate, to harden and cool before breaking it into pieces. You can watch how we make this crunchy treat in our 'How it's made' videos too! Although we love our brittle here in the United states, be it peanut, almond or cashew, candy lovers all over the world have their own variations. Confectioners in the Middle East mix pistachios into their batches, while in Asia, they add sesame seeds along with the peanuts. 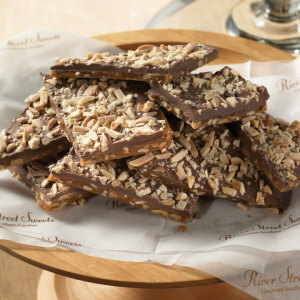 At River Street Sweets in the heart of the South, we use only the freshest of ingredients in mixing up this timeless treat, and take the greatest of care to stretch each batch of brittle on marble tables to harden into peanut laden perfection.